When you’re on the lookout for a new bathroom vanity countertop, the key is to mix something that is easy to maintain, easy to clean and complements the space surrounding it. 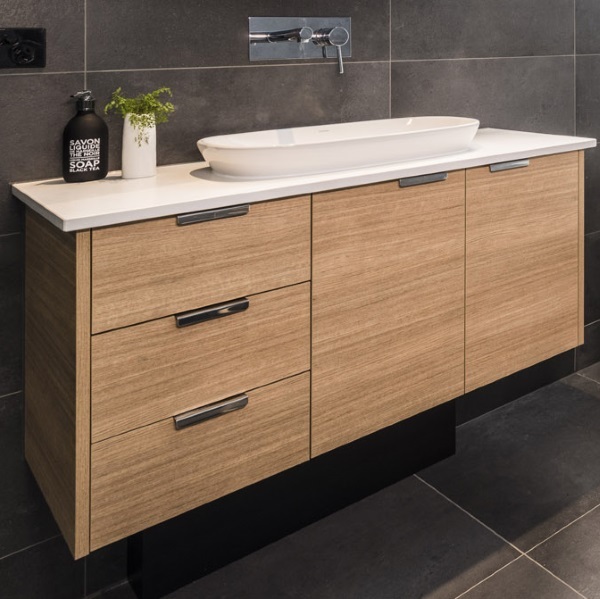 We’ve put together this handing buying guide, comparing different types of bathroom vanity units of all the most popular materials available today. Luxe Look. Your bathroom countertop—often called a vanity top—won’t encounter hot pans and cooking spills. That means, unlike in the kitchen, you can allow style to hold greater sway in the decision. Choosing a luxurious surface makes every evening feel a little like a stay in a posh hotel. Think about options such as color, finish and tactile feel. Practical Nature. Though style reigns, steamy showers, splashing children and spilled toiletries all take their toll. Especially in a busy bath, it’s important to choose a countertop that holds up to daily use while maintaining its looks. Along with everyday concerns—soap, toothpaste and shaving cream—factor in tougher culprits like hot curling irons and chemical hair dyes. Custom Blend. In a small space such as the bath, surfaces go a long way toward establishing the general style. Unless you’re relying on the countertop as a jumping-off point for a redo, aim to achieve cohesive design by selecting surfaces that complement the existing floors, wall treatments and furnishings. No matter how much you love marble, for instance, it probably won’t look right in a colorful kids’ bath. Price Points. Estimate your square footage requirements and gather information about countertop costs. If budget is a concern, consider compromises: If you love stone, you could select tiles instead of slabs. If you fall in love with an out-of-reach surface, consider installing it in the powder room rather than the master bath. Whatever you choose, try to enjoy the process as much as you savor the result. A top choice for five-star bath remodels, granite is a versatile, durable surface. Formed from quartz, feldspar, mica and other materials, this igneous rock produces a striking surface with a variety of color options. Strong enough for the busiest kitchens, it can easily withstand anything the bath dishes out—from dropped glasses to hot flat irons. Measurements: Countertop thickness varies by geographic location from three-quarter inch to an inch and a quarter (preferred). Standard overhang is an inch to an inch and a half. A range of edge treatments is available, including straight, beveled and rounded. Color: Granite comes in a wide range of colors, including gold, blue, brown, green, violet, black and white. Finish: Choose from a few finish options. Polished granite is sleek and shiny. A honed or matte surface is less glossy and a little more porous. A leather finish offers unique texturing reminiscent of leather. Slab or tile: Unbroken expanses of granite lend a luxurious look and exude contemporary flair. Granite tiles offer the same surface beauty at a lower cost and with simpler installation. Practicality: Polished surfaces in dark colors can show watermarks and fingerprints. Granite is virtually nonporous, so water won’t cause damage. 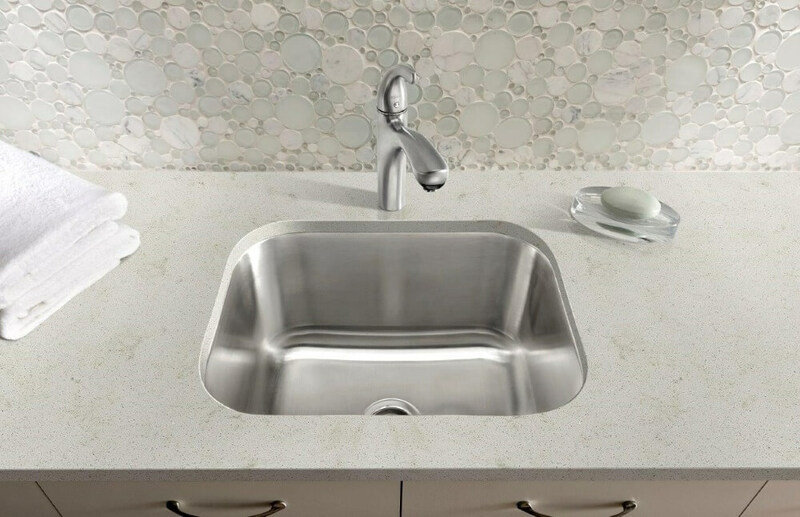 Sink types: Options include drop-in, undermount and vessel styles. Budget Considerations: Beautiful granite can be a pricey countertop option. And if you’re choosing granite slab, unlike tiles, you can’t just buy what you need—you need to purchase the whole thing. A professional will then cut it and install it carefully. Measurements: Countertop thickness are typically from three-quarter inch to an inch and a quarter (preferred) Standard overhang is an inch to an inch and a half. Edge options range, though straight remains the most popular. Color: Choose from a wide range of shades, including white, brown, green, gray, black, red and pink. Depending on your style, opt for a quiet backdrop or an eye-catching statement. Finish: Marble comes in various finishes including polished (for a glossy shine), honed (for a matte appearance) and antiqued (for a slightly more weathered look). Where to purchase: When choosing marble, do your research and seek out a reputable dealer. Quality varies a great deal depending on factors such as where the stone is quarried. Practicality: Marble requires maintenance and sealing, and that still may not protect from scratches, gouges and stains. Use extra care with hair dyes, perfumes, colognes and bathroom cleansers, as these kinds of liquids can cause staining or etching. Budget Considerations: If you love the look of marble but it’s out of your price range, consider engineered marble countertops. This is composed of approximately 93 percent marble and seven percent polyester resin and pigments. This creates a more durable surface that better resists stains and scratches. Engineered marble also has a lower absorption rate and requires less maintenance. Measurements: Slabs are available in half inch, three quarter inch, and an inch and a quarter thicknesses. Thicker sizes are more expensive. Choose from at least 15 countertop edge options, from bull-nose to beveled. If you’re worried about chipping, go with rounded edges. Color: Dozens of colors are available, and quartz offers one clear benefit over natural stone: more options than nature alone can provide.Just consider shades like apple martini green or funky crocodile-print surfaces. Colors range from quietly traditional to ultra hip. Finish: Options include polished (smooth and glossy), honed (with less sheen), and textured finishes. Practicality: One of the most practical options for busy baths, quartz stands up to staining, heat and scratching. Unlike natural stone, it never requires sealing.